Alex Robinson visits the UK’s leading shepherdess, TV star and bestselling author Emma Gray, who offers her top tips on how to train the young sheepdog. Fallowless Farm, nestled in the remote Northumberland countryside, is the home and work space of Emma Gray and her 20 Border Collie sheepdogs. At 23, Emma was given the chance to take on the isolated National Trust-owned farm, which is made up of 60 hectares (150 acres) of severely disadvantaged land. Emma says: “I took on the farm in the bad winter of 2010, but it wasn’t until the following year I was able to move in due to heavy snowfall. Four years later she was invited to join a large farming partnership, which involved taking on an additional 81h (200 acres) of land. The move meant she could expand her livestock enterprise to such a scale she could give up contract shepherding. With the aim of breeding top quality working sheepdogs, her home-bred canines are registered under the Graylees prefix. Alongside the dogs, she runs 400 cross-bred ewes and a herd of 20 Galloway and Whitebred cows, put to a Whitebred bull to produce blue grey progeny. Mules and Texel crosses are put to Blue Texel and Texel tups before she sells half the lambs in summer through the store market and the rest which are finished on-farm at about 45kg liveweight. About as far from civilization as can be, the farm is flanked on three sides and located next to a 202ha (5,000-acre) commercial forest. Emma has made headlines for her sheepdog training talents, having been a world trail semi-finalist and an English team member twice, with several championship titles to her name, including the English nursery title. Emma credits the training business for funding the capital she needed to kick-start the farm. Living at Fallowlees and maintaining such a career has been a challenge for her, and she chapters the journey in her published book ‘One Girl and her Dogs’, published in 2012. “The book provided some income for the farm,” says Emma, “and there have been talks of making it into a TV show. The 2017 season saw Emma and her team triumph at national and international levels. Emma’s current trail dog, Tweeddale Jamie, was her partner in last year’s World Trails, where they helped the England team bring home the gold medal. Competing alongside her were trail veterans Nij Vyas, Ricky Hutchinson, Jed Watson and Tim Foster. A son of Ricky Hutchinson’s previous English National Champion Sweep, Jamie was an English nursey winner in 2016. “Jamie is easily the most complete dog I’ve ever had,” says Emma. Roy was Emma’s first trail dog who ended up taking her to the dizzy heights of international competition. A talented dog which first stepped onto the trail field at a mere 15-months-old, Roy secured victory in the Northumberland league. Coming through the ranks is Joff, an 18-month-old son of Jamie. Ensuring basic training is completed early and effectively is essential for any prospect trainer starting out with a sheepdog. But knowing how to get on terms with a young, eager dog can be a challenge. 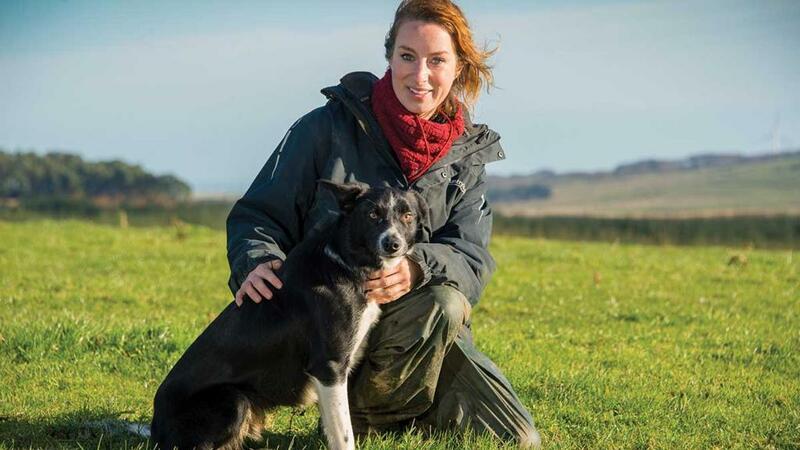 Emma Gray gives Farmers Guardian her top tips on how to train a young sheepdog. While arguably a necessity for every domestic dog, Emma hails obedience as the key factor which should be in place before training can even begin. “Good obedience should be firmly instilled in your dog before you even consider working with the sheep,” she says. Emma recommends teaching basic training, such as sit and stay commands, before considering more serious work begins. If a handler is able to call a dog back on voice command, there is little risk of becoming out of control when out on the field. It is important the dog has manners and comes to heel when asked. The universal command for bringing a dog back to heel is ‘that will do’. It is also essential the young dog understands and responds to its name, which should be a one syllable word which doesn’t sound like another key command. Initially, the pup will experience confusion and could find training exciting to begin with. If things start to get a bit frustrating, Emma says it is important not to take it out on the dog. “Go in the house, have a cup of tea and try again. The amount of time it takes to train a dog varies massively, as it can with people. Ensuring you are training in a sound and safe environment is imperative for handling success. “There is no point taking your young dog straight out onto the hill and expecting it to gather the sheep right away. Well dogged sheep. Training a dog with wild, unhandled sheep will be difficult and could ignite the natural wolf instinct. Some handlers use geese or duck flocks in in the initial stage of training, as they are slower and easier to keep contained. When we see a young dog with bounds of potential, it can often be easy to rush into extensive training. But Emma advises handlers not to rush youngsters which can quickly become overfaced. “It is common to get overly keen when we see a dog has the potential to round up and gather sheep. It is better to wait until they are a bit older, usually about 10-12 months depending on your dog’s temperament, to start serious training. Don’t start training with too many sheep. Using a quiet trio will ease your dog into the process. As livestock attacks continue to cloud the headlines, Emma says pet dogs also need to be disciplined round livestock and can also benefit from obedience and basic training.